Musicians on stage during the 2017 Jazz and Heritage Fest in New Orleans. Susan J. Weiand photo. 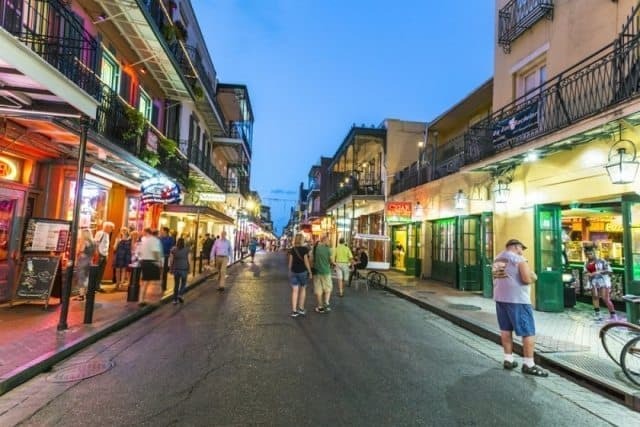 Time to start planning for Jazz and Heritage Fest which is just around the corner, so why not head down to the jazzy city of New Orleans, Louisiana? This year’s fest includes Aerosmith, Sting, Jimmy Buffet, Beck and many many more. The spring is the perfect time to get a more relaxing experience of the city, after the wild celebrations of Mardi Gras in February are complete. Start your trip off with a stroll around Jackson Square, a picturesque park in the French Quarter. Take in the local artists and performers, while you overlook the Mississippi River. Jackson square is full of history, from the beautiful St. Louis Cathedral, the oldest Cathedral in North America, to the Lower and Upper Pontalba Apartments, which are home to oldest apartment buildings in the United States. Once you’re done seeing the sites, check out the shops, museums, and restaurants that line the square. Stay close to the square by booking the Andrew Jackson Hotel on bonwi.com, for an average of $169 per night, and get 2,782 points in return to spend toward your flight home. Explore the colorful streets of New Orleans. It’s not a trip to New Orleans if you don’t visit Bourbon Street. The famous street is the ideal place for a fun night out, filled with burlesque clubs, cool bars, and great food. Aside from the nightlife, Bourbon Street, like Jackson Square, is filled with history. Head into Galatoire’s Restaurant, which was founded by Jean Galatoire in 1905, for lunch to enjoy a fusion of French Creole dishes. Walk down the street to have your ears filled with foot-tapping tunes, what the city is famous for. In the almost 200-year-old Fritzel’s European Jazz Club, enjoy the old-school side of music, where you can dance to live traditional jazz music every day of the week. End your night by plopping down on your bed at the elegant, 4-star Royal Sonesta Hotel. The site of the hotel dates back to 1721 when the city of New Orleans was first designed by Adrien de Pauger. Opening in 1969, the hotel’s architecture embodies New Orleans, having an exterior to replicate the feel of 1830s New Orleans’ houses. Booking a $179 room now with Bonwi gets you 1,313 points to spend at your leisure.